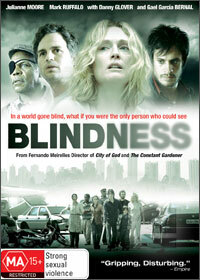 Director Fernando Meirelles (City of God, The Constant Gardener) brings José Saramago’s allegorical novel to the screen. At its heart, the movie makes a speculative point about human nature and morality by plastering us with questions… the sort of deep questions which no one else can really answer for us and which we must spend a lot of time on. Quite a simple scenario it is. People in a bustling city randomly go blind. At first one, then the other, then more and more. To make the narrative watchable and understandable, a small group of infectees is cobbled together by merely having been in contact with each other. They are deported to a disused medical facility where various clans emerge. This hermetic microcosm is in fact a microscope for the descent into chaos and the animal nature which civilisation perpetually endeavours to suppress. The sense of right and wrong is decayed into one of mere survival—to eat is to survive. Yet a religious parable is always cherished, so the one person with immunity from this white-blindness bug is The Doctor’s Wife (Julianne Moore, very much in command). In the country of the blind, the one-eyed (or two!) man (or woman) is indeed king (queen!). With her obvious advantages, her group, which includes the women, is able to out-manoeuvre the decidedly more dehumanised rivals, led by the self-appointed (and somewhat Nietzschean) King of Ward Three (Gael García Bernal). The microcosm dissipates when its barriers crumble, but saying any more will spoil it for you. I enjoyed the rich ‘meaning’ built into it by the writers and the director. True, it may be over-handed and unnaturalistic for some tastes, but personally it’s a rewarding watch. It is shot beautifully and has some tense ‘suspense’-genre moments. Expect a lot of FADE TO WHITEs. I also agree with some online comments. The Japanese couple seem like a bit of an unwelcome overhand and an obvious producer insertion (Japanese funds were apparently crucial in securing the production). This is a minor concern in the grand scheme of sweep of this ambitious and relevant metaphor. As the line goes: we have eyes, but can we see? See Blindness for sure. Extras include “A vision of Blindness” (a making-of) and Deleted Scenes.